The 2014 land-and-sea temperature anomaly map shows that four continents were nearly entirely above normal. The major cold spots were eastern north America and western Asia. Analysis courtesy of NOAA. Possessing a sizable lead after 11 months, the forces of Global Warming could have coasted to a warmest-year-ever with a desultory December. Instead, the sixth monthly record in the last 8 months propelled 2014 to a record-warm global land-and-sea average temperature that has both advocates and skeptics shaking their heads in disbelief. The former are scrambling to re-work their forecasts of future global temperatures upward, while the latter seek refuge in any argument to try to salvage their case. How Warm Was It In 2014? The average global land-and-sea temperature was 58.24 degrees Fahrenheit, breaking the record set in 2010. The average land-and-sea temperature surpassed the previous record by .07 degrees, the greatest increase for any new record year. The global land-and-sea temperature set new monthly records in six months, all from May to December. The global sea temperature set new records in every month from May to November. 2014 was the 38th consecutive year in which the average global land-and-sea temperature was above the 20th century average. New land-and-sea temperature records have been set three previous times since 1998, but this is the first record year in which there was no El Niño. The upward spiral of temperatures in the last two-thirds of 2014 caught climatologists by surprise, though the trend has been discernible for some time. The average global land-and-sea temperature has increased by .11 degrees per decade since 1880 and by .28 degrees per decade since 1970. At the more recent rate of change, the earth will reach a rise of 3.5 degrees Fahrenheit above pre-industrial levels within 80 years. Many scientists have warned that a 3.5 degree increase could be a tipping point, beyond which catastrophic changes in the weather are inevitable. If the upward acceleration of the rate of temperature change continues, the threshold will be reached sooner. The temperature trend since 2000 is about the same as the longer-term trend. Graphic courtesy of NOAA. Even the latest year’s temperature data do not convince the most determined climate-change deniers. But their arguments are disintegrating, and their ranks are beginning to thin. It is inevitable that some scientists, for reasons of ego or enrichment, will retain mistaken beliefs long after those beliefs are proven wrong. Some continued to doubt the roundness of the earth even as Magellan approached from the east after having set sail to the west. This myth has been perpetuated by right-wing talk show hosts, but a Professor of Atmospheric Science should know better. The claim is demonstrably hogwash. Any reasonable statistical smoothing of the data shows that the increase in temperature since 2000 is at close to the same rate as over any other time period since the end of the 1800s. The Arctic warmed at about twice the rate of the rest of the planet, while the Antarctic actually cooled. Eastern North America was colder than normal. Western Asia was colder than normal. Europe had its warmest year. 19 separate nations in Europe had their warmest years. Virtually the entire continents of Africa, South America, Europe, and Australia were above average. Each continent had large areas of record heat. Eastern North America had its 33rd coldest year since 1880, bucking the trend of every other continent. England had a record wet winter followed by a record dry September. Austria received barely half the normal amount of precipitation in winter 2013-14, but had record rainfall in May. Six Super-Typhoons formed in the western Pacific Ocean. What Will Be Done To Stop The Runaway Temperature Increase? It’s quite obvious that humanity, collectively, has the ability to stop global warming before it reaches a point of no return. Decoded Science has pointed out two hopeful precedents: CFCs, which were causing a hole in stratospheric ozone, were phased out; and testing of nuclear weapons was banned. But the problem of global warming so far seems intractable. For one thing, the CFC problem wasn’t particularly difficult to solve because other chemicals could do the same thing. Nuclear weapons present an existential threat to those making the decisions, so it was relatively easy to get agreement on banning their use. Global warming also threatens great harm to civilization — at some unspecified time in the future. Many people, including political leaders, seem to have the attitude that climate change doesn’t pose much risk now, and probably won’t in the lifetimes of those making the decisions. Each of us must decide whether it is our right to leave a different, and almost surely far less hospitable, world to our descendants. International leaders will meet next December in Paris to try to work out an agreement on curbing greenhouse gas emissions. The recent preliminary meeting in Lima, Peru ended with nothing more than an agreement to try to agree. The basic schism remains between the developed countries which don’t want to cut their emissions substantially and developing countries that want to increase theirs. Homo Sapiens has always proven to be a resourceful species, but with a penchant for brinkmanship. If 2015 is another year like 2014, with land-and-sea temperatures, perhaps propelled by an El Niño, continuing to accelerate upwards, political leaders might respond. The future of Earth’s atmosphere is, literally and figuratively, up in the air. Palm Beach Post, Print edition, 1/17/15. 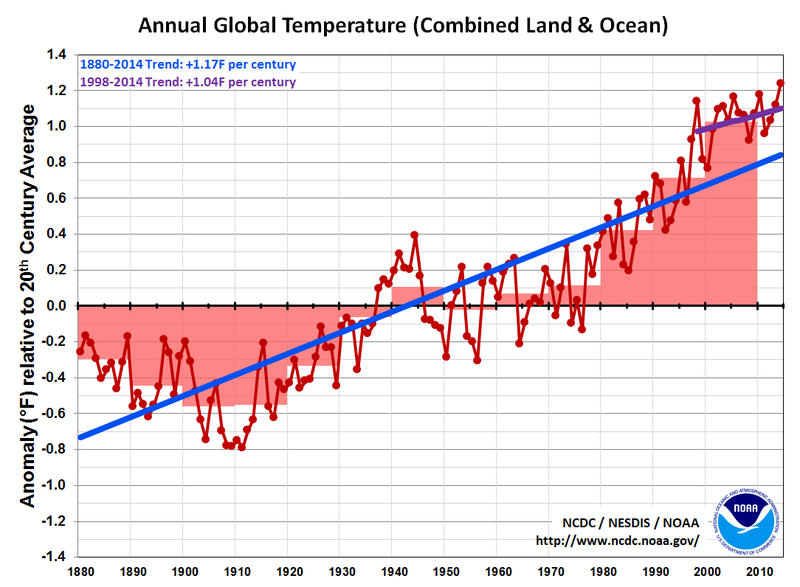 Scientists say 2014 was warmest year on record. (2015). It cracks me up that so many self-proclaimed experts think global warming requires multiple-degree temperature changes, and point to the temperature of the air. The kinds of changes you point to — less than one-tenth of one degree, are amazingly large. How much energy would one have to provide to raise the temperature *of the entire earth* one tenth of a degree? And would it not be the water and the land that would be the truer indicators of that increase? For instance: how many automobiles do they air cool? Are they not almost all water cooled?